So the whole conceit of the game is that you and the crew of the spaceship Burke’s Gambit have been searching for the remnants of an alien civilization. “The Company” is the one employing all of you to search for the advanced alien technology. Once you have loaded your ship with everything it can carry, you shut the doors and start your trip back to Earth. But the ship’s alarm sounds, informing everyone that an alien pathogen is aboard, and one of you is infected. To make matters even worse, the Captain tells everyone that the engines have been sabotaged, and the ship is hurtling back toward Earth. The only way to save Earth is to find the person who is infected and push them out the airlock. But the Company Men, who are called the Acquisition Support Specialists, want to bring that alien specimen back to earth to create a horrible biological weapon. The Salvage Crew want to push the infected person out the airlock to make sure that Earth and everyone on the planet is safe. 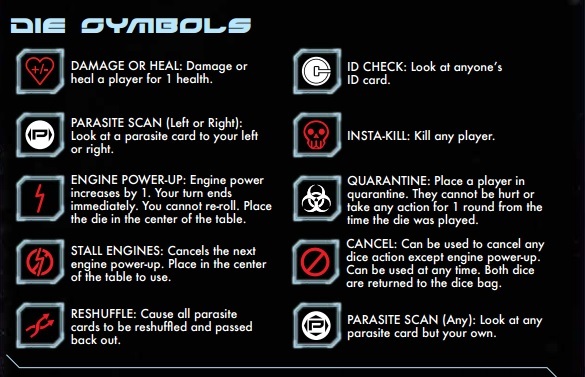 At the beginning of the game, every player is going to get three cards: an ID Card, a Role Card, and a Parasite Card. The Role Card is public knowledge. Roles are jobs like Technician, Captain, etc. They each have their own individual special once-a-game powers. Throughout the game, you’ll potentially have the opportunity to inspect other people’s infection card, but you’ll never get to look at your own card. So you have absolutely no way of truly knowing if you are infected or not. At the beginning of each person’s turn, they will take a die out of the bag, roll it. If they like the face they rolled, they can do that action. If they do not, they can re-roll it once. At that point, they can either reserve the die, execute that action, or discard the die back into the bag. You can only have one die reserved at a time. If you roll the engine power up, your turn is over and the die is played into the center. Once you play a certain number of engine power up dice into the center (it’s dependent on player count), you reach Earth. At that point you have one minute to discuss before you all vote on who to shove out the airlock. If the person shoved out the airlock is infected, the Salvage Crew wins. If there is a tie or a non-infected person is shoved out the airlock, the Company People win. If the Captain is still alive, they break ties. The dice part is definitely cool, but it can be a bit annoying sometimes. There was one game where we rolled a ton of engine power up faces quickly, so by the time we got to Earth we had very little information with which to vote. But in most of the games I’ve played, we were able to ferret out a lot of information, albeit the sources were always suspect! During one of our games, we went around the table and everyone’s parasite cards were checked, and literally everyone said that none of the players was the parasite. We had to sift through a complicated logic of who had checked which player’s card and which cards had been double verified (seen by the people on the right and left of the person) in order to make a guess. Thankfully a couple of my friends got the right logic, because I totally voted wrong! So far in my play throughs of Burke’s Gambit, no one has ever reshuffled the parasite cards and no one has ever killed another player. Those are both pretty bold strategies, which you would only want to employ for a couple of different reasons. I would only want to kill another person if I knew for a fact that were on the opposite team than me and if I was sure they were not infected. That would ensure a better vote process and have one less person to worry about. When a person is killed, they reveal their infection card, but they do not reveal their ID Cards. So you will never know if you killed someone on the other team or your own team. Now if someone was playing a Company Person, they would want to try to kill someone if they have been decidedly identified as the infected person. It’s a super high risk move though, because killing someone is a pretty suspicious move, because the only people that know for sure who is on the opposite team are the Company Players. If you kill the infected person, it will reshuffle the parasite cards. This will throw everything out the window, people will probably not have enough time to try to figure out who is infected before we get back to Earth, increasing The Company Team’s chances of winning. But from now on, your words will never be trusted, because it will be pretty obvious which team you’re on. So it’s definitely a dangerous action to take. With the Role Cards, there is a decent amount of diversity, both in gender and in race, which is great. 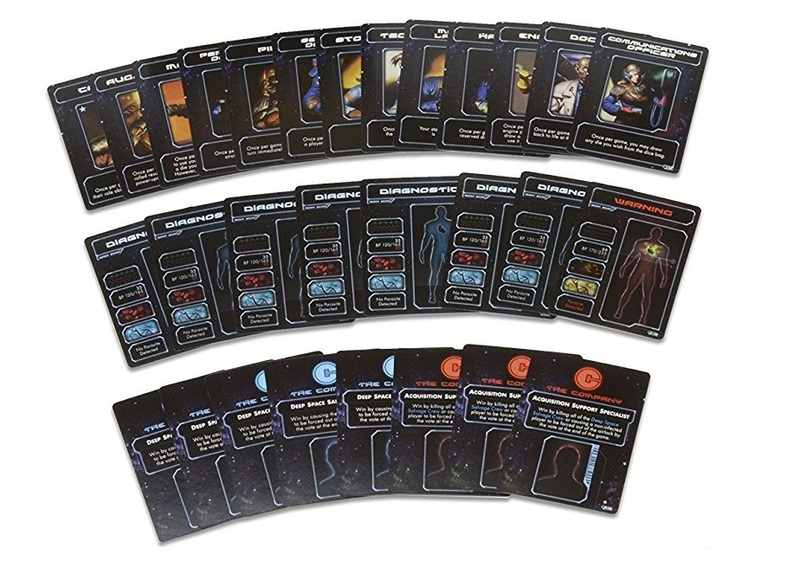 There are also 13 different Role Cards, each with their own abilities. It’s nice that they provide so many different Role Cards, because it means you’re never quite playing with the exact same roles all the time. It adds a bit of nice variety to the game. 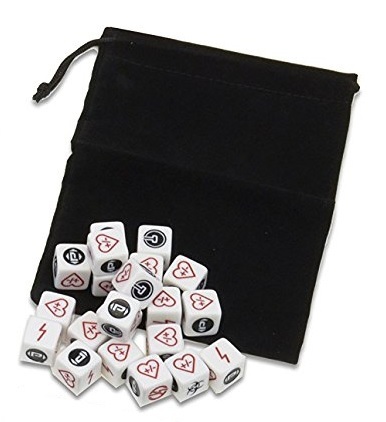 The dice also add some great variety. You can’t always get all the information you want, because you are limited by what you roll. Some of the faces are actually super rare. The insta-kill, reshuffle, look at the ID Card of anyone, and look at the infection card of anyone but yourself are all very rare. They are super powerful, and can completely change the game, depending on their use. We have never rolled a reshuffle face, so it’s never happened in our games, but I’m sure it would be a devastating move for the Salvage Crew Team. We have also only ever rolled a check any parasite card but your own face once. This face can be a huge help in the game, because it lets potentially three people verify the same infection card. We’ve actually rolled the insta-kill face, but have never used it. Overall, I think Burke’s Gambit is a well designed game that plays well and is super fun. It doesn’t have the level of deduction that say Secret Hitler has, but it is fun in its own right. It isn’t as deep, but it plays much quicker than Secret Hitler. The fact that it plays in just 20 minutes or less makes it the perfect game to break out to start a night of gaming, which is just what my gaming group did a couple nights ago. We played several games in an hour and then moved onto a longer game. It’s also incredibly compact. You can throw it in a small bag and take it anywhere. I will say that although the game does allow you to play with four people, I wouldn’t recommend it. The play time is much shorter, you don’t get much information, and there’s only one Company Person in the mix. I would recommend playing with at least 5 people, because that’s when you add in a second Company ID card. Having at least two Company People really makes the game more fun, because there’s so much potential for incorrect information! Burke’s Gambit is a great social deduction game with fun new mechanics that’s quick and relatively easy to learn. It’s also cheap and compact. All of this combined makes it a must buy for me, and has definitely earned a place on my shelf and a spot in my gaming rotation. 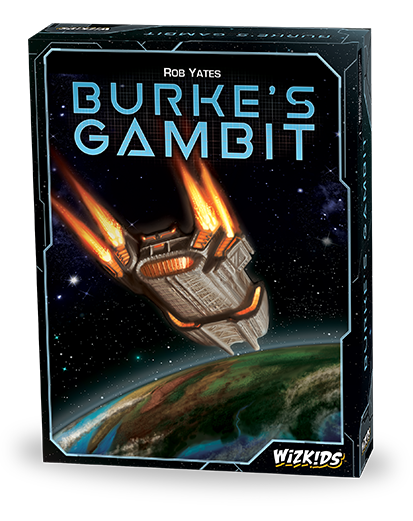 Burke’s Gambit, designed by Rob Yates, and was just released by WizKids, is for 4-8 players, takes about 20 minutes to play, and costs $19.99.